You how it goes: The weekend finally gets here, and you’ve only got a few free hours before it’s back to the psycho treadmill of the week. You have a choice: You can work on something fun, like a hobby, or you can do some housecleaning. Let Brian J. tell you how you can do both–at the same time! I like to get out something in my hobbies–collecting (accumulating!) things–and I put it in the middle of everything. Like when I cleaned my office the last time, I took the ill-advised long boxes of comic books (I organized my comic books and put them in long boxes like you see at comic book shops, but then I learned long boxes don’t fit onto shelves-they’re designed for tables of comic books like at comic book shops! ), and I put them into the hallway so I could vacuum my office. But it is a dark hallway! So I could leave the boxes there for months! And I did. So today, armed with some new short boxes (which fit nicely on shelves! ), I did both housecleaning and hobby! 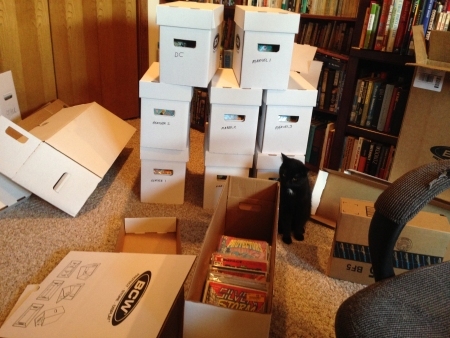 I reorganized the comics and cleaned up the hall! So keep that in mind! Sometimes you have to make a bigger mess just to clean it up–especially if you want to spend your weekend hours most efficiently! Now, someday I’ll do something about the other boxes in the hallway containing overflow Atari 2600 cartridges and record albums. Someday–on a weekend where I want to think I was doing housework! Then, this morning, I went looking for the book on my bookshelves, and I could not find it. Which exasperated me a bit and truly gave me the whole experience. I rediscovered this book as I turned around the books on the shelves in the hallway, and it’s the right time to read a book about football, am I right? After all, once September starts, all of my reading is going to be coloring books and chapbooks. This book comes ten years after One Knee Equals Two Feet. 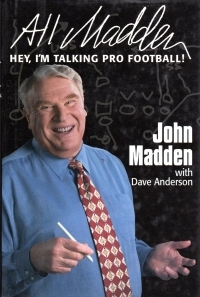 In it, Madden talks about his all-Madden team and the beginning of some football “traditions”, such as the Madden football video game, his bus (he didn’t like to fly), and the Thanksgiving turkey awards. He also talks about players he’d include on his All-Madden team (through 1996), including Jerry Rice and Emmitt Smith. Because this book only precedes my football fandom by about five years, I recognize the names of more of the players than I would in a book about the 1970s or 1980s (unless, of course, it’s a book about the Packers). Madden also talks about coaching, officiating, and even other sports. It’s a quick read built on topical chapters, and it’s gotten me revved up for the football season more than the online reporting of the training camps and preseason have been. Contemporary journalism focuses a lot on personalities and injuries, but football books remind me how complex the game is and how difficult the playing of the game is. I need a reminder like that because I tend to watch something and think I could do it as well as the people on the screen. Which is not the case (as a recent visit to a ninja warrior sports gym reminded me physically). Oh, and I would be amiss if I didn’t point out that he alludes to having read Travels with Charley, and that he enjoys criss-crossing the country on his bus because he gets to see the country that way. How fun. I bought this book nine years ago because the author wrote (or continues to write) the fiction column for Writer’s Digest, a magazine I took off and on for twenty years until I realized that scanning magazines about writing was not making me write more. Later that year, I bought Opening Nights, a novel by Janet Burroway, who wrote the textbook I used in a collegiate writing class simply because I wanted to see how she, and Kress, did with their fiction since they were also instructing about it. So I’ll probably read the Burroway presently if I can find it. 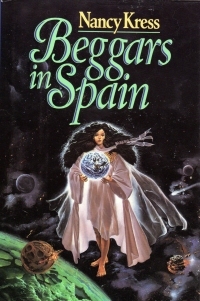 At any rate, Beggars in Spain is a science fiction book set in the near to medium term future of 1993. The driving point of it is that, soon, genetic modifications before birth will become normal, and one of the strangest is preventing the need for sleep. This creates a bunch of kids called Sleepless who eventually become smarter than their peers because they don’t waste time sleeping. Eventually, it comes to light that they do not age much, either. This creates a stratified society of super-productive and hyperrational citizens who carry a heavier tax burden than others, and the stratified society leads to some enmity between members of each class. The Sleepless try to create a Sleepless-only refuge planetside and then an orbital satellite where they can work, learn, and earn free of interference from the less productive sleepers. The book is broken up into sections, each of which takes place in a certain year, and the years are separated by decades. The sleeper children grow up, but the Sleepless do not age. The main character, if you will, is a Sleepless who had a twin sister that is a Sleeper; it starts on their relationship as children and then the Sleepless sister becomes an attorney, which gives the book an in to dwell on the legal and ethical ramifications of what’s going on. Which she does. So you’ve got a science fiction novel with Heinlein and Rand overtones. It definitely explores some themes, and it does so kinda wordily. The action in the book is overshadowed by the thematic musings, unfortunately. One almost expects the leader of the Sleepless to deliver a long speech to the Sleepers. But the thematic explorations are thoughtful: one gets a little sense of both sides in the Sleeper versus Sleepless philosophies, and one expects the ultimate goal is some Hegelian synthesis of the two. In researching for this book report (by that, I mean when I looked at Wikipedia), I discovered this is the first part of a trilogy. There’s no real cliffhanger at the end leading to a second book (as a matter of fact, there’s no cliffhanger at the end of each section/year in the book that leads to the next), so I’m not sure where it would go from here. Sleepless in Space? Regardless, now that I’ve satisfied my curiosity in the work of the Writer’s Digest fiction columnist, I’m not eager to continue the saga. Would you ride in a fully autonomous robot cab? Why not? What could go wrong? As you might remember, gentle reader, I bought this book on my my recent trip to Florida. 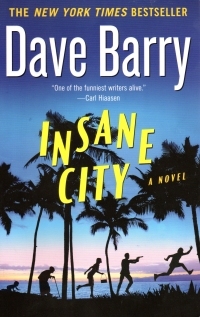 I read Big Trouble ten years ago and liked it, and, hey, it’s Dave Barry. So it should be funny and a Florida book (which I wanted to read while in Florida). The setup is this: A young man is preparing to wed the beautiful, smart, and a bit controlling daughter of an uberwealthy man. He and his groom’s men arrive in Miami, the location of the wedding, and have a bachelor party. The bachelor passes out under the table for a bit, and his party moves on without him, and he loses his luggage with the ring in it. The rest of the book follows the zany adventures of the groom trying to retrieve the ring, harbor illegal aliens in his room, and deal with the problems of the groom’s men. Much marijuana is smoked. Sadly, although it could have been a tour-de-force akin to Downtown by Ed McBain, but the setup of this book requires a bunch of drinking and marijuana to set up the situations. The construction of the series of events seems very artficial, as though it were crafted specifically to be made into a film akin to The Hangover and the like. So I really didn’t enjoy it that much. It didn’t carry me along, although it did give me a new phrase to use: “Well, the ape is in the car now.” Which I use to express that something not very enjoyable is moving along a little better. Because once the ape gets in the SUV in the book, it moves along a little better. Although I still didn’t really laugh at anything after it. Since some of the old-school bloggers are getting rich with household tip blogs, or at least are earning more than the $.50 a year I am from blog ads and book sales, I thought I’d dip my toes into the water to see if I can get some of that sweet, sweet life hack money. 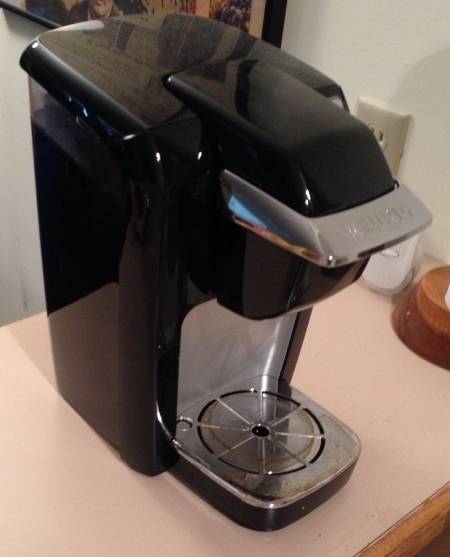 First up: The Keurig Counter Mess. Brian J., what do you do when that black (or brownish, honestly) stain displays on your counter top? 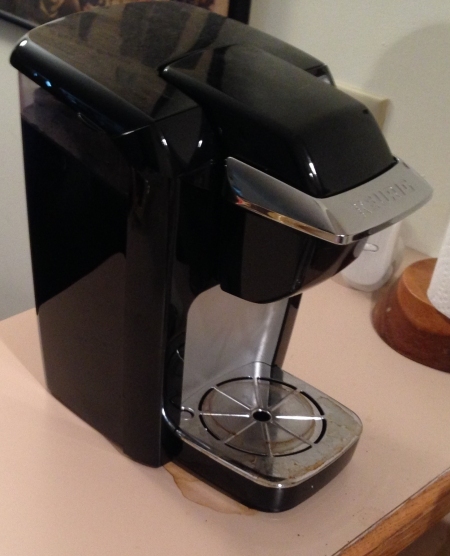 I move the Keurig to the left an inch and a half! PROBLEM: SOLVED THE BRIAN J. WAY! Please let me know in the comments below what you think of my solution! I received this book as a Christmas present. You can find a pile of books from the same publisher in the local interest section of the book store, and I guess my mother-in-law picked it up when she bought me the new Woody P. Snow novel, which she also gave me for Christmas. 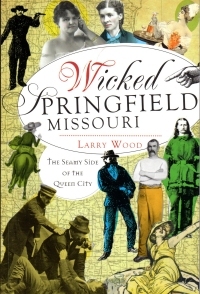 At any rate, this meticulously researched book covers crime in Springfield from its establishment as a town to the 1910s. Unfortunately, the information is presented as an era-per-chapter docket from the crime report section of the newspaper (one of the historical sources). We get a lot of citations for liquor violations, a lot of prostitution, and a little other murder and mayhem, but it’s presented very drily in a who did it and where fashion. A couple incidents, including the Wild Bill Hickoc shootout and the murder of Sarah Graham, get full chapters with a bit more flavor and narrative, but otherwise it’s just a litany in paragraphs. It could certainly have been improved with more local flavor or more in-depth looks at some of the people involved, as the chapters that focus on the individual incidents are the best in the book. I’ll probably steer clear of these titles and other thin roll-up local interest books from now on. Unless they’re fifty cents at a garage sale or a gift. On Friday morning, I sneaked off to a small local church in Republic for its annual yard sale. I know from past experience that the church’s sale has a small selection of books, so I bypass the majority of the items–clothing–and find a couple things to take home. A History of God which looks to be a textbook covering Judaism, Christianity, and Islam. The Arabs, a history/sociology/anthropology of the Middle East. Let the Hammer Down, which might be a Christian inspirational humor book. All I know is I bought it because the author’s name, Jerry Clower, is awfully like Jerry Crownover. I’m not kidding. It doesn’t take much to convince me to buy a book. Lone Survivor by Marcus Lutrell. It was fifty cents, kids. I had to. Fields of Fire, a Vietnam novel by James Webb, the former Senator. A picture book about Forest Park in case I happen to watch any football games this autumn. 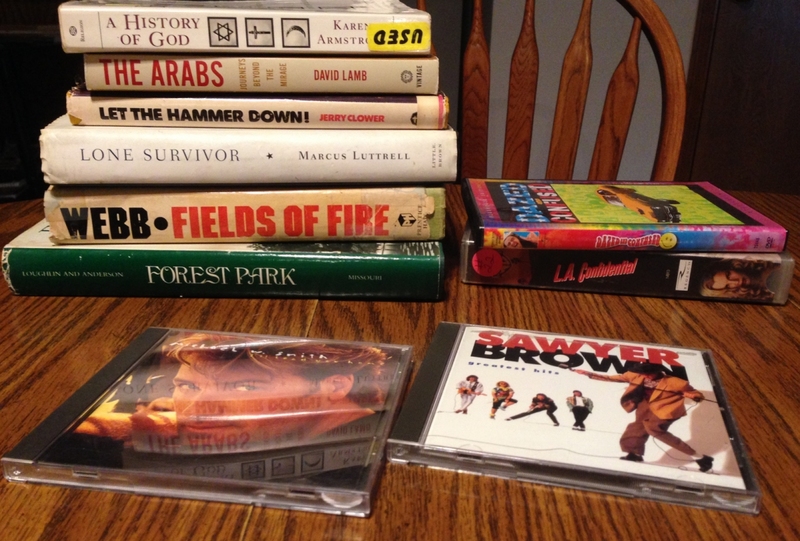 I also got two CDs: The Greatest Hits of Sawyer Brown for me and something by Michael W. Smith for the family. I also picked up two films, LA Confidential on VHS and Dazed and Confused on DVD. I feel comfortable making all these purchases since I’ve already read 40% of the books I bought a week or so back in Florida. But as you know, gentle reader, the only time I’m uncomfortable buying books is when I’m carrying one or more fifty pound boxes of them at a book sale. But that pain passes. Point/Counterpoint: Being a Lost Boy: Good or Bad? I find both arguments slightly persuasive; I am more interested, though, in how suddenly there are two songs on the radio using the Peter Pan metaphor. While it’s never been far from public consciousness, it seems odd that the pair of songs appear at once. Also, a point to consider: Is Ruth B related to Stevie B? Probably not, been we start throwing around acts with single initials, I start connecting. This book was the last I read completely on my vacation. It’s 360+ pages, which meant it would take some time regardless. But my interest and enthusiasm waned for the book as I went on. 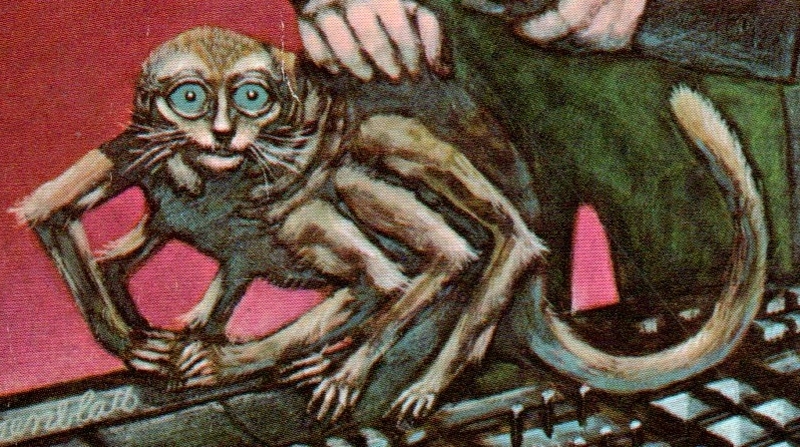 As a matter of fact, I found a bookmark that might have been mine about forty percent of the way through (at the start of the letter H), which means I might have already tried to read this book and then threw it back sometime in the past. 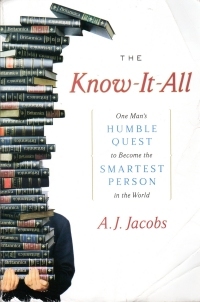 To sum up: The subtitle for the book is One Man’s Humble Quest to Become the Smartest Person in the World. The author decides sometime in the middle of his fourth decade (that is, about 35) to read the entire contents of the Encyclopaedia Britannica. So the thumbnail description sounds interesting. The chapters are based on letters of the alphabet, and there are “entries” with a word or phrase from the encyclopedia that leads to a paragraph, a story, or something from the author. However, the book really is more a memoir of a yuppie editor of a magazine (Esquire), the child of well-to-do parents who lives with his wife in an apartment in New York City, during the year where he read the encyclopedia, travelled and visited his parents’ home in the Hamptons (several times), reminiscences of travel to Europe (several times), and the difficulty of having a baby and dealing with a brother-in-law who’s more talented and perhaps smarter than the author. It’s almost like reading a Woody Allen film except that there are parts where the author drops trivia into conversation (sometimes annoying the people he’s talking with). This last bit is one of the redeeming features to me. I was getting a bit annoyed with it about the time I got to the letter H (where the bookmark was), but I powered through because I didn’t have any more appealing books (at the time) on vacation. 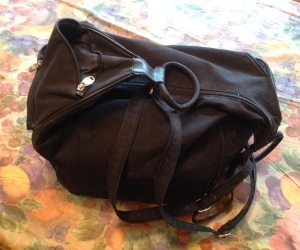 So the book falls deeply into the “Not my bag, baby,” realm. Which is a shame because the topic could have, but I get the sense the fellow read the entire encyclopedia to get a book out of it. I’m always a little down on books where it seems the author does something just to write the book. It’s like a literary selfie. And on a side note, in this volume circa 2004, the author takes a number of shots at George W. Bush, of course, but also Donald Trump. I wonder what he’s made of 2016 so far, but not enough to look at what he’s written since this book. 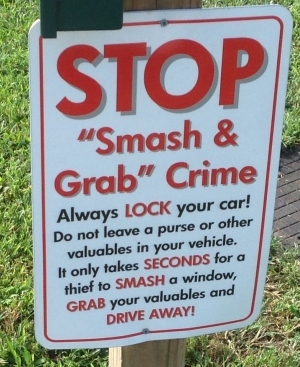 There’s no smash in the smash and grab if the vehicle is not locked. There’s only grab crime. A resident of South City (St. Louis, that is) offered this advice: Don’t leave anything in your car and don’t lock your car. Otherwise, the baddies will smash the windows to get in. Whether they steal anything or not, you’ll be on the hook for a new window. Basically, the trade-off is this: Locking the car will stop a casual thief, but a determined thief will have to break the window to steal. 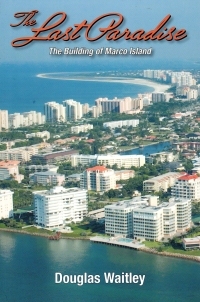 This book reads as a corporate history book of Deltona Corporation, a land development company run by three brothers named Mackle who cut their teeth with inland developments and then turned their attention to Marco Island, an island on the southwest coast of Florida. In 1962 (twelve years after John D. MacDonald recommended the beach there), they built a hotel and then some housing for middle income Americans with the trick that each house on the island would have its own dock. They made a good start of it, dredging canals and swamp to create a series of waterways that meant many of the houses had a street in the front and a dock in the back. Unfortunately, the success was not to last, and the company ran into trouble. Dredging permits were only good for three years, so the company split the island into five parts and planned to get a permit for the section they were building. They got a couple permits renewed, but by time the early 1970s rolled around, the environmental movement ramped up and opposed any further development. Although Deltona Corporation had been environmentally conscious in its development, environmental groups wanted to make an example: that even an environmentally conscious and responsible corporation would be brought to heel. And so it was. Deltona was in trouble because it had been selling undeveloped lots to fund current development, and when it could not develop those lots as planned, it had to recompense the owners. Which drove the business to sell off a bunch of profitable things to square up. One of the Mackle brothers interviewed for the book pointed out that Deltona could have declared bankruptcy, it did not because that was not the way things were done. The book differs greatly from normal Florida reading where the land developers are greedy bad guys. This book presents them in a favorable light, if perhaps a bit creative financially. And audacious: The design for Marco Island, only partially completed, was quite a hit with the land-buying public in the 1970s, and the homes on the island still go for a pretty penny. So I enjoyed the book a bunch and was able to relate to my family elements of the island’s history while we were staying there. So it was a good use of part of my vacation. 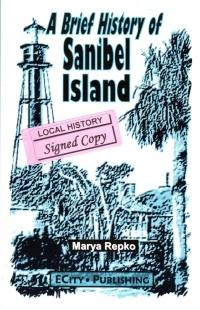 I also bought this book on Sanibel Island, although this is not an autographed copy (unlike A Brief History of Sanibel Island, previously reviewed or coming soon depending upon the order in which you read these posts. It’s the beginning of a series that goes on at least three or four more books. It deals with a retired newspaperman (there are a lot of those floating around in Florida, apparently–remember, the antagonist of Slam the Big Door was one) who opens a detective agency on Sanibel Island for something to do. He doesn’t get many clients, but a twelve-year-old boy comes in looking for his mother. He has a number of cards from her, but he’s not sure who she is. He’s living with someone else now. 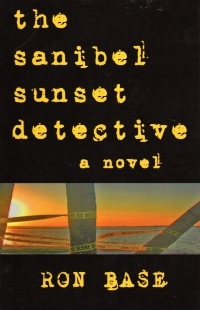 The boy is not very forthcoming, and Tree Callister, the Sanibel Sunset Detective, doesn’t put much stock in it. Until a local hoodlum visits because he thinks Tree knows where the woman is. Then the mess is on, as the boy is on the run and hiding from cops, Tree, and the minions of a media mogul who looks to be based on Conrad Black. It’s a bit of a wild plot, but not bad. At first I thought the book was going to be self-indulgent in the fashion of Roger L. Simon’s Moses Wine books (see The Big Fix, The Lost Coast, Peking Duck, and California Roll) as the detective is very self-consciously sixty years old (although he’s not courting death like Mrs. Stone), so he’s dwelling on that and the prose itself throws back to his youth with a lot of allusions and whatnot. But it improves once it gets rolling. The book unfolds well as the dilettante detective finds himself over his head with bad guys, ex-cons, and dangerous women befuddling him. That much is relatable and good, but there’s a coincidence that the plot turns on and the narrator goes a bit Mary Sue at the end. But I enjoyed the book enough to look for others in the series in other book stores I visited in Florida (bookstores not named “Gene’s Books” on Sanibel Island), but I couldn’t find them. So I’ll get around to ordering them online one of these days. The book is recent enough that the places that it name-checks are still around (Jerry’s Supermarket, for example–I shopped there). This differs from some books that I’ll get around to reviewing after I get around to finishing them. So I’ll read more in the line, which is about the best recommendation you get from me. This book reads like any small town history book. It details, briefly, the history of Sanibel Island, an island in southwest Florida that is home to a number of resorts and hotels but also has many individual houses. Sixty percent of the island is actually given over to wildlife refuges and parks, so it’s more lush and green than other regions. Sadly, though, a week after reading it I don’t remember much about it because the book focuses a lot on the different families and what properties they owned and what became of them. Which is not very narrative nor exciting enough to retain. So interesting, I suppose, if you’re traveling to the island, but not something that will be of interest if not. I bought this book on Sanibel Island itself, and it’s probably not available anywhere else other than online sources. And I scored an autographed copy, so I’ve added it to the Nogglestead Estate. Which leads me to wonder: Does removing the Autographed Copy sticker increase or decrease the value of an autographed book? This book is the third I read on vacation. As you might remember, it is one of three books I bought at the Friends of the Springfield-Greene County Library this spring amid oh so many albums. It’s a short book–111 pages. It’s not a play, it’s a short novel, with dense, vivid prose that draws some attention to itself as it waxes and muses. The plot deals with an aging, retired actress who got by on her beauty rather than her acting ability, which means that she gave it up when she realized she was aging out of beauty. Her wealthy husband dies on a European trip, and Mrs. Stone finds herself in Rome, where a penniless contessa matches aging wealth American widows with young Italian men not so much for marriage as for expensive gifts. 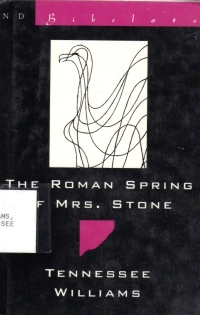 When Mrs. Stone realizes what is going on and that she is growing fond of one such young man, she invites death before the loss of her dignity. So, basically, if you imagine a bit of a mash-up of Mrs. Dalloway–a bedraggled figure is following Mrs. Stone as the young war veteran’s story is interweaved with that of Mrs. Dalloway. However, in this book, the bedraggled figure is death in the form of a serial killer preying on wealthy American widows is following Mrs. Stone awaiting her invitation to strike–and The Awakening set in the period of Three Coins in the Fountain. Which explains why I saw all the scenery described in Deluxe color. At any rate, the prose, as I mentioned, is deep and rich, but ultimately the book was unsatisfying because of the stylized nature of the suicide and the fact that a fifty-year-old woman was considered washed up enough to kill herself to preserve her dignity. It’s not very flattering to fifty-year-old women of the era. Strangely, this was made into a film twice: In 1961 and in 2003. Neither of which are going onto my Amazon wish list. I took a recent trip to Florida and discovered the wide diversity of nature that you find there, which frankly is wider than the diversity of the nature you find here in Missouri. It had better be because it costs a couple thousand dollars to take a family from here to there. Also, the nature found in southwest Missouri tends to run the gamut between livestock and the grass it feeds on. Except for the woods, which are dark and scary and I don’t go there often. But in Florida, it’s always sunny except for those minutes during the afternoon where southwest Florida pulls the rain clouds and lets it rain for a little bit. I’m not sure how they figured out weather control on the west coast of Florida. Here in Missouri, if it’s going to rain, it gets cloudy and threatens rain for a couple hours, enough to make you doubt, then cancel, then reinstate your outdoor plans, then get caught in a brief shower so you pack up, only to have the scattered shower stop when you’re on your way home. Florida showers are far briefer than that mostly. At any rate, on my trip, I saw some of the natural wonders that Florida has to offer. For my second book of my vacation (the first being the last chapter or two of Slam the Big Door), I started on this book. It’s one of Robert Heinlein’s youth rocket jockey books from 1953, so it’s not as, erm, liberated as his later adult fiction. 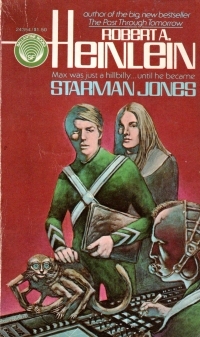 In it, young Max Jones is a farmer in the Ozarks. He’s living at sustenance level, plowing with borrowed livestock, and providing for his stepmother and acting as the man of the house after his father passed away. His stepmother marries a man from town who then tells Max that he’s selling everything, including the farm and Max’s uncle’s books, and he threatens Max with physical punishment for disrespect. So Max lights out for Earthport. He runs across a seeming hobo who steals Max’s ID card and books and presents himself at the Astrogator’s Guild to claim a place as a trainee; however, neither the hobo nor Max can claim that position. So when they meet up, the hobo helps Max forge papers and take off in a space craft on a year-long interstellar flight. A series of events occur that lead Max to move up from the livestock handler to, ultimately, the Captain of the ship (briefly). It’s a quick read (even though it’s 252 paperback pages. It’s an interesting take on interstellar travel and the world where it is possible from the perspective of 1950 something. Max is an Ozarks farmer using livestock in this future, but from what I know of rural Missouri in the 1940s (see Growing Up In The Bend, for example), 1953 was not that far past draft animals and electricity in rural Missouri. The use of computers tracks perhaps with World War II naval operations but not so much with 21st century usages. So you have to have more suspension of disbelief than normal. But if you’re looking for rocket jockey science fiction from time to time (and you should), you could certainly do worse than Heinlein. My wife and I have taken to calling it the Spider Monkey Puppy in the intonation of that obnoxious but forgotten Super Bowl commercial. I spent the first couple of days of the vacation making up horrific facts for the Spider Monkey Puppy, but in reality, it’s a pet. But not in your dreams, gentle reader, not in your dreams.